Hello! Yesterday I announced my month-long Share Handmade Kindness Challenge. Today I am back to start Week 1 of the challenge and I hope you can play along! 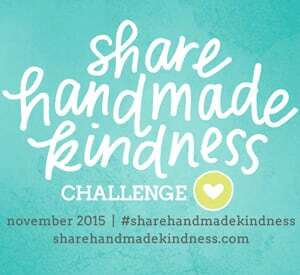 Week 1 (November 2 – 8) will focus on sharing any kind of handmade kindness with friends and family. This is often the easiest kindness to share, so it is a good place to start. Participating is easy. Simply make and GIVE something to a friend or family member. It can be a card, sweet treat, handwritten note – anything made by the hand, from the heart counts. It is that simple! The more you give, the better. This is all about spreading kindness… especially when it is least expected. That’s it. These three companies were very generous to offer these prizes. Please consider checking out their products – such good people! If for some reason you can’t participate, no worries. I will have other random giveaways throughout the week! Stay tuned. A few people asked if there was a badge or image they could share on their blog. You can download this one HERE. Thank you so much for joining me in this challenge! After years of making and sending cards, I felt a calling to do more. This should be fun! Hugs all around. I cases Jennifer today & made a set of notecards for my mother in law & a set of 20 thank you cards for my daughter in law to use for my grandsons 1st birthday party gifts. Such a great idea! Thank you Jennifer! Made 10 cards and some extra surprises this week – going in the mail tomorrow to friends and family! Made a bunch of Christmas cards for my family and friends, Thanks for the challenge. Thanks for the challenge and the inspiration, Jennifer. I made a card to send to my sister, who lives 3,000 miles away! This challenge is a super idea, we all need more kindness! Love this project. I made a birthday card. I posted it to my Instagram account @scraps_n_needles. I made a “Congratulations” card for my sister. She just bought a new house. It’s posted on my Instagram account @scraps_n_needles. I sent cards to two friends who are having some health issues. They were some I had already posted so didn’t link them up here. I’m making some holiday cards that double as holiday decor to my father’s widow along with a gift set of golfing cards for her to give to her friends. Creat a tag for friends & family to share this message. Since we are tagging the #sharehandmadekindness, I have the idea to write the tag in watercolor my own to share my handmade kindness. I am so excited about the hero arts stamp set I have ordered from SSS! This is a wonderful way to share kindness. Thank you, Jennifer, for this challenge. I made a card for my Mom to say thank you for all that she does. I can’t wait to see what this coming weeks challenge will be! I shared handmade kindness in the form of chocolate chip cookies for my teen son’s. They can use an expression of love in the form of yummy calories! This is such a fabulous initiative you’ve started! Can’t wait to see what else is in store. I am a veteran special education teacher. This school year I have the privilege of being a mentor to two first year special education teachers in my elementary school building. I am so proud of them and all their hard work. I love to make them little surprise gifts every month, just to encourage them and to celebrate their teaching “firsts”. Last week, they held their first ever Parent Teacher Conferences. This weekend, I made them each a little note pad to use at their desk, with each page stamped with a cute little stamp that matches their interests and personalities. I packaged them up with a pen. Can’t wait to leave them for them on their desks in the morning! For this week’s challenge, I made a label for a handmade jar of grape jelly that I made – I surprised a friend with this at her office! I created this Thanksgiving card (also added to the link up) and mailed it to my aunt. I made a birthday card for my brother- in- love. I also made 28 Christmas cards for residents of a nursing home. I made lunchbox notes for my kids (try to do it every week) and a Thinking of You card for my brother and his family. They are going through a very rough time. It’s been fun to see how much the campaign has inspired people! I made my first no-line Copic card to say thank you to Grandmama for helping to decorate my baby’s First birthday party autumnal party. Tagged with #sharehandmadekindness on FB. Thank you so much for your ideas! They are always wonderful! My last card went to my sister-in-law who had a Halloween birthday. Such talented and caring people. Aren’t card makers just the greatest folks? What a great challenge Jennifer! I made a card for my sister. She lives close to me and we see each other every week but I never send her cards and I think she’ll be tickled pink to get one from me! I know it’ll make her day! I gave cards to my mother, two best friends and my boyfriend to remind them of how special they are to me. Jennifer, for this Act of Kindness I hWe all need a lift. I hae been doing this on the phone and have gotten surprised responses as customer service usually gets complaints not compliments or cheerful goodbyes with a wish for them to have a wonderful day. I made this Thanksgiving Card. I gave it to my friend. Sharing kindness make me happy. Love this campaign. Wish I had felt this kindness when I was in school. I love to see all your card videos, they are awesome, you inspire me to make a cards each time I see a video. I am learning so much from your shared knowledge and videos. I am making some Christmas cards and well wish cards from my family and friends. I am even planning on wrapping some cards up as gifts. I love how you do that. That is a neat idea. Thank you for all you inspiration you give to us crafters. I made a Christmas Screen card for my aunt. She is very religious so I heat embossed Joseph, Mary and baby Jesus in gold embossing powder, also the 3 kings and on the other section I also put a shepherd with sheep. The sentiment said Come All Ye Faithful. I put gold stars on it and snowflakes. friends ans additionally sharing in delicious. And naturally, thanks to your sweat! Thanks for sharing your thoughts about apartamenty wynajem katowice. Fantastic items from you, man. I’ve take note your stuff prior to and you’re simply too magnificent. of all colleagues regarding this post, while I am also eager of getting familiarity. Very good site you have here but I was wanting to know if you knew of any message boards that cover the same topics discussed in this article?